The book: The Longevity Factor How Resveratrol & Red Wine activate genes for a longer and healthier life by Joseph Maroon, M.D. On Page 193 Dr Maroon writes this on Vivix: "There is growing evidence that a combination of resveratrol and other potent polyphenols might provide improved health benefits due to the synergistic properties of different polyphenols from different plant sources. Shaklee Corporation, a direct selling nutrition company has recently released a product called Vivix, which is described as a cellular anti-aging tonic. It contains a multi-source polyphenol blend. In conversations with the company, they state that the blend includes 100 mg of 98 percent pure resveratrol from Polygonum cuspidatum long with a proprietary extract derived from the fresh pomace of muscadine grapes (Vitis rotundifolia) The company recommends 5ml per day of Vivix, which they state is equivalent to the abount of resveratrol found in 100 glasses of red pinot noir red wine. The muscadine polyphenols in this blended product along with the added resveratrol, European elderberry extract, and purple carrot extract will increase the total overall polyphenol content of this product. A month's supply will cost a member $85.00. 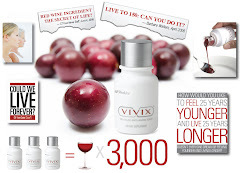 In Shaklee's accompanying literature for Vivix, they state that the Vivix ingredients were shown in a laboratory study to be 10 times more powerful in slowing a key mechanism of aging than resveratrol alone." Also, on Page 70, the author expands on the value of the muscadine grapes and the advantages over European grapes. "Muscadine grapes are native to North America, and may be the only fruit that originated in the United States and nowhere else. They grow almost exclusively in the southeastern United States. They thrive under adverse conditions, perhaps due to their thicker and tougher skins compared to European grapes....muscadines have an extra chromosome(twenty instead of the nineteen other grapes have). These additional genes allow muscadine grapes to produce a unique phytochemical, ellagic acid. The ellagive acid polyphenol compounds that are in muscadine grapes are vitually absent in other grapes. Ellagic acid is used by the muscadine grape skin to make tannin called ellagotannins, whichis used as an antimicrobial by the plant. Ellagic acid also has powerful antioxidant and anticancer properties....the polyphenols in muscadine grape skins have been shown to have positive effects in heart disease, high cholesterol, diabetes, metabolic syndrome, and other inflammatory conditions. One of the more interesting effects of muscadine products appears to be their inhibition of AGE protein formation." Continuing, the author states:" Recently, a large nutrition, direct selling company, Shaklee Corporation, working with scientists from the University of Georgia, has created a product containing an extract made from muscadine pomace which is the remaining fruit solids after the water content is extracted. Specificaly, they are working with muscadine grape growers in order to secure grapes with large amounts of protective polyphenols including ellagic acid and resveratrol. By selecting muscadine grapes and by using a whole grape extraction process, they have reported that their extract has a significantly higher concentration of healthy polyphenols than found in the skins themselves." The above are excerpts from the book "The Longevity Factor" The author Joseph Maroon, M.D. FA.C.S. studied medicine at Indiana University, and Oxford University. Dr Maroon is a world renowned neurosurgeon and former president of the Congress of Neurological surgeons, the larges society of its kind in North America. He is currently a professor and Heindl Scholor in Neuroscience at the University of Pittsburgh Medical Center. Interesting to note: he is a lifelong athlete, competed in more than fifty triathlons, and three Hawaiian Ironman Championship competitions. The book is heralded as a groundbreaking examination of new scientific research that holds the secret to weight loss, increased strength, endurance, memory, and a healthier, longer life. I believe the author, Joseph Maroon, M.D. has no connection with Shaklee Corporation,and the references in the book to Shaklee Corporation and our product Vivix..serve as an excellent third party reference.